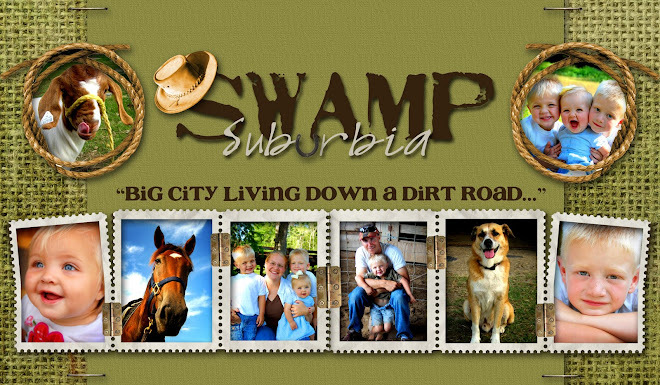 Swamp Suburbia: It's a Girl!! Yesterday when I was gathering children to go outside to feed the animals, I received a phone call. It was my father-in-law. 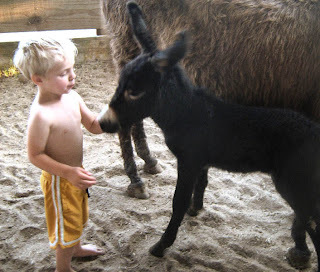 He said, "We have a baby donkey! It's black!" I was so excited. I looked out my back door and Molly and her baby were way in the furthest corner. I could not see a thing. So, the kids and I jumped in the van and went to go to the back of the property. On our way around, we saw that the donkey was headed back to the front. Back to the front of the property we went. We were on a donkey chase. We got back up to the barn and finally got all the horses inside and where do you think Molly is? She ran back to the back corner again. *sigh*. I really wanted to see the baby donkey, in all it's cuteness. 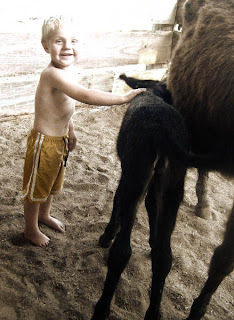 So, I did what anyone desperate to see a baby donkey would do, I went after the donkey, with a bucket of feed. We were armed and ready for the chase. The boys came with me. 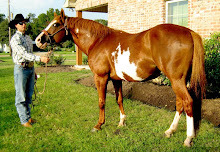 We walked all the way to the back of the 20 acre pasture shaking the bucket and yelling her name. It did not faze her. Until we got almost to her, and she realized we were going to feed her. She came over to us. But my cowpokes were too excited about the baby and she started to run away again. So, the chase was back on. I used my cowpokes as my rear donkey wranglers. I got in front of Molly with the bucket and the cowpokes ran up the rear. Molly was headed to the barn. Then, she got stuck in knee deep mud. And let me tell ya, knee deep Louisiana mud is enough to stop a big momma donkey dead in her tracks. Molly finally gave up. She came over to me to eat some grain. We finally got to see the little baby up close and personal. It is so darn cute! I just want to hug it, love it, and bring it in my house! But I don't think Molly would like that very much. Molly did not like me very much. But she did not seem to mind Little Cowpoke getting in close. My little redneck child got right in there and petted the baby. I couldn't believe how sweet the baby was. She is so black! And those ears, I just wanna squeeze her. While Little Cowpoke rubbed the baby, Big Cowpoke ran back to the barn and got me a halter. We finally got Molly into the barn. The boys were so excited. On the walk back they were saying what they wanted to name the baby, "Lets call her Junior, no Judy!" Little Cowpoke said, "June we call her June" I suggested we call her Velvet. But the boys just looked at me funny. But since Molly was a Christmas present, I thought maybe she could be called Noel. 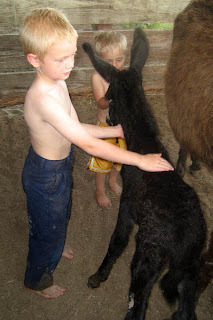 In a stall the baby donkey got hugs and kisses by all. She is just so lovable. Big Cowpoke would catch her so his little brother could pet her. Not that the baby was going anywhere, but it made him feel good to catch the baby. It was cute. Just tell me what is sweeter than kids and babies? Little Cowpoke thought she needed help with drinking milk. 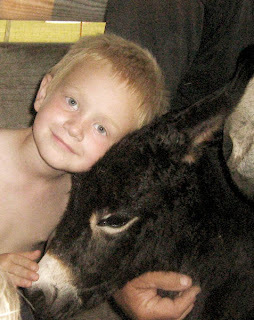 After about 100 hugs and even more kisses it was time to let the little baby donkey have a rest. She was such a good sport about the kids being around her. And Molly was a nice mom to let us in the stall and play with the baby. Congratulations Molly on a beautiful baby girl. OH MY GAWD! That is so darn CUTE! Thank you for the smile! Look at that! Sooooo darn cute! Maybe she'll let me pet her Saturday???? I am about to die from the cuteness overload!! 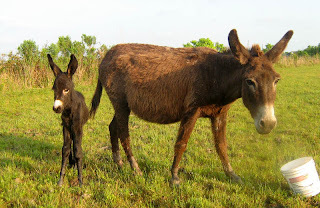 Donkeys are too cute already, but a baby! Congrats! How about I trade you a litter of puppies for that wee one? Is that a fair trade in cuteness? 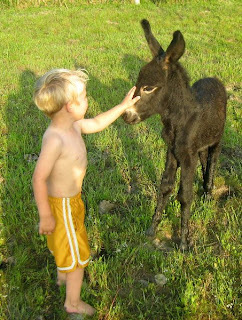 Wow - have never laid eyes on a baby donkey before - gorgeous moments with your kids/cowpokes. Just about a dead heat with my puppies I reckon!!! Cute-looking donkeys. 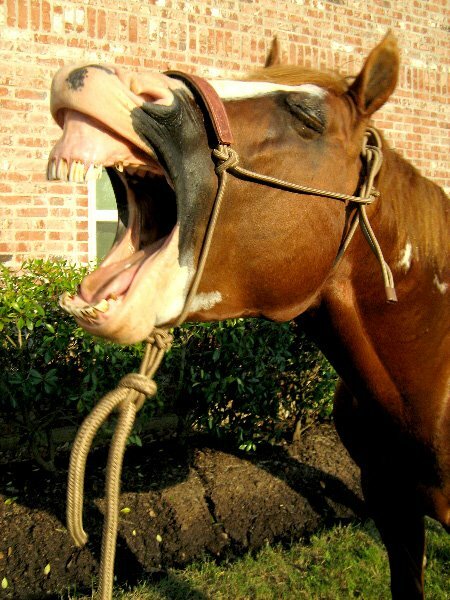 Were these ever used on a farm? What kind of breed are they, I wonder. 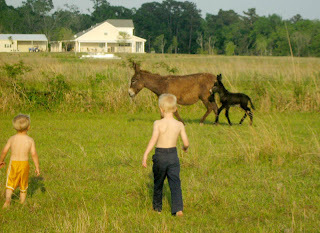 I thought full sized donkeys were cute--but that baby!!! OH my goodness.